If you’re a classical music fan, chances are that you’ve listened to the Kronos Quartet. But what about the “Millennial Kronos?” Now’s your chance. Dubbed the “Millennial Kronos” for their eclectic repertoire and dynamic view on 21st century musicianship, SYBARITE5 performs everything from Bowie to Radiohead and Akiho to Assad. 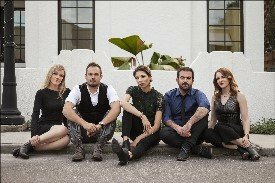 On Friday, Feb. 15, the group will bring their unique performance style to Penn State Behrend when they perform as part of Music at Noon: The Logan Series. Their concert takes place at noon in McGarvey Commons, in the college’s Reed Union Building. Admission is free, and reserved parking for audience members will be available in the Reed lot. Comprised of Sami Merdinian and Sarah Whitney, violins; Angela Pickett, viola; Laura Metcalf, cello; and Louis Levitt, bass, SYBARITE5 is the first group of its kind to win the Concert Artists Guild International Competition. The quintet’s debut album, “Disturb the Silence,” reached the top ten on the Billboard charts, and the group has conducted their “Evolution of an Entrepreneur” residencies and workshops at major institutions and conservatories, including the Curtis Institute of Music and New England Conservatory. For more information about The Logan Series or SYBARITE5’s appearance, contact series director Gary Viebranz at 814-898-6289 or email gav3@psu.edu.